Lathera, also spelled ladera, is a classic Greek dish that grew out of simple peasant-style cooking. The Greek word for oil is lathi and these dishes are oil-based, thus the name which translates loosely to "with oil" or "oily." It goes without saying in Greece that oil refers to olive oil. Lathera dishes are almost always vegetarian, made up of one or more vegetables cooked in an olive oil-based sauce that often includes tomatoes, garlic, herbs, ​and spices. 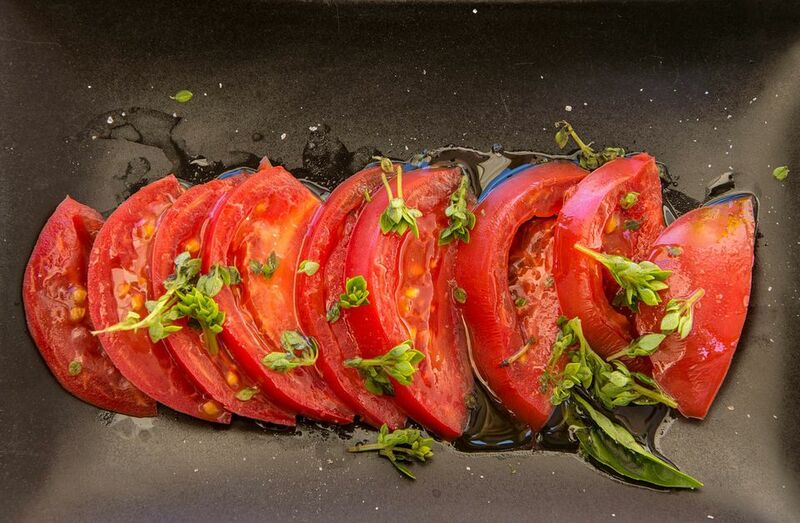 The earliest versions of lathera were tomato-less because tomatoes were not introduced in Greece until the 17th century and they did not really catch on until the 19th century. Nonetheless, these dishes are a staple of the cuisine in modern times. Lathera dishes are favorites any day of the week but are especially appreciated during Lent and other times of fasting when meat and dairy products are restricted in the Greek Orthodox tradition. Aromatics are sautéed in olive oil. Tomatoes are added and left to simmer. Add your vegetable of choice—green beans, spinach, okra, eggplant or almost anything you prefer—and cook until it becomes tender. With few exceptions, that is about it. Cooking times can vary depending on the vegetable you use. Spinach wilts and cooks much more quickly than eggplant or beans. Favorite Greek lathera dishes include potato ragout and green bean casserole. Experts recommend consuming between five and nine servings of fruits and vegetables a day. That is a lot, particularly if you shudder at the sight of a heaping mound of plain old vegetables on your dinner plate. Greek lathera recipes simplify that dietary requirement and make it much more palatable. Depending on the exact recipe, many lathera dishes meet the daily requirement for vegetables on their own, and often without a lot of excess carbohydrates. You will probably come close to meeting your daily fiber requirements with one of these dishes as well. As for the olive oil, it is a prime source of antioxidants. You will get all these health benefits from relatively minimal calories. A lot of the success of these dishes depends on good quality tomatoes. Resist the urge to used canned or processed products. It's simple enough to grate your own tomato pulp. Remember, these are peasant-style dishes that rely heavily on wholesome and fresh ingredients. Authentic Greek cuisine tends to use a lot of olive oil, but you can cut back to meet your own personal tastes if you prefer less. If you are not following a strictly vegetarian diet, you can add a little beef stock to many lathera dishes for added richness. Lathera dishes are often served sprinkled with feta cheese or with chunks of feta or manouri cheese, but this option does not work for vegetarian and vegan diners. Instead, use crusty bread as a great accompaniment to help sop up the delicious juices. Turkish and Arabic cuisines also have lathera-type dishes that are staples of their cuisines. In Turkey, it is called yemekler or bil zayt in Arabic. Both cooking terms mean "with oil [and it is understood that it's olive oil]." What Is Mahlab and How Is It Used in Greek Cooking? What Do These Pizza Words Mean?